Showing at the Chopin Theatre March 28 through May 19, 2019! The House brings to life the classic fairy tale of a wooden boy who wishes to become real. Carved from an enchanted stump from a charred Forest, toy-shop owner Geppetto's puppet child flourishes. The growing Pinocchio devours books and the complex worlds they reveal. He relishes musicals and the emotional ride they offer. And he longs to sink his adolescent teeth into real relationships and conversations beyond the walls of his storefront home. There must be more out there! But his protective father keeps Pinocchio's wild branches trimmed back, and forbids venturing out. A method sure to inspire rebellion in this precocious, curious not-quite-real young man. Our character of Pinocchio will be portrayed by an evocative, life-size Bunraku-inspired puppet, created and crafted by Chicago Puppet Studios. Molly Brennan as Geppetto. Photo by Michael Brosilow. Sean Garratt voices and puppeteers Pinocchio, puppet design by Chicago Puppet Studio. Photo by Michael Brosilow. 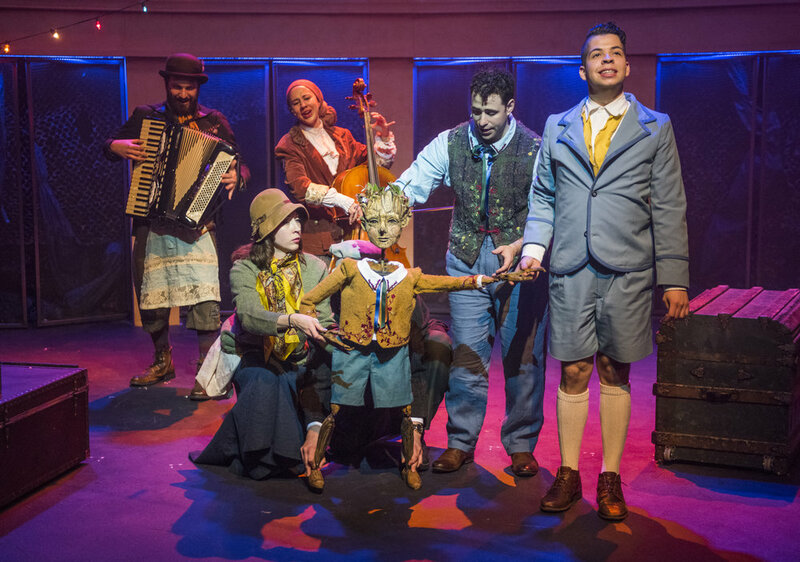 L to R: Tina Muñoz Pandya, Karissa Murrell Myers, Brandon Rivera, Omer Abbas Salem, Sean Garratt, puppet by Chicago Puppet Studio, and Carley Cornelius. Photo by Michael Brosilow. Sean Garratt, puppet by Chicago Puppet Studio, with additional puppeteer Kevin Stangler. Photo by Michael Brosilow. Karissa Murrell Myers as the Blue Fairy, shadow puppets by Chicago Puppet Studio. Photo by Michael Brosilow. Karissa Murrell Myers as the Blue Fairy, puppet by Chicago Puppet Studio, and Sean Garratt. Photo by Michael Brosilow. Sean Garratt, puppet by Chicago Puppet Studio, and Molly Brennan as Geppetto. Photo by Michael Brosilow. 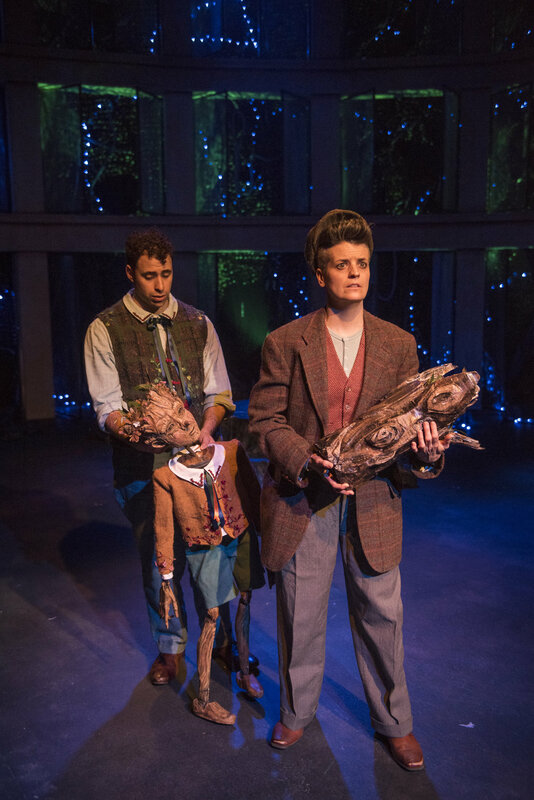 L to R, front: Carley Cornelius, puppet by Chicago Puppet Studio, Sean Garratt, and Brandon Rivera as Romeo. Photo by Michael Brosilow. Sean Garratt with Pinocchio puppet by Chicago Puppet Studio, Brandon Rivera as Romeo, and Christine Mayland Perkins as Miss Penny. Photo by Michael Brosilow. Sean Garratt and Pinocchio puppet by Chicago Puppet Studio. Photo by Michael Brosilow. Sean Garratt and Pinocchio puppet by Chicago Puppet Studio, with Molly Brennan as Geppetto. Photo by Michael Brosilow. Discounted tickets for Sensory-Friendly, Open Caption, and Audio Description are offered with code “ACCESS”. Questions? Call us at 773.769.3832 or email us at access@thehousetheatre.com. Learn more about ACCESSIBLE PERFORMANCES here. Now on sale through July 2019! RUN TIME: This is a 90-minute experience.